Consider the Linksys WRT1900AC router if you want to distribute an ADSL2+, cable, or fibre connection to many wireless devices in a busy home, and especially to 5GHz devices capable of 802.11ac transfers. It has a clean and easy to understand interface, though it could still use some work to make it better. Linksys released its flagship WRT1900AC, 802.11ac router a good few months ago now, and our intention was to bring you our review after one month of solid usage. The key word here is 'solid', as it's something that this router failed to exhibit in its performance during our initial tests. We put it aside for a while as we tested other wireless routers (the D-Link DIR-880L being the most recent), and came back to it in October with the hope that Linksys would have by now provided new firmware to shore it up. The good news is that Linksys did indeed release new firmware since our initial tests, and it went a long way to address the instability we had with this router, which had manifested in regular automatic restarts and Internet drop-outs on the 5GHz band (we had to switch to the 2.4GHz band to use the Internet in these instances). We're now well into November, and after a full month of testing, it appears that those instability issues are now almost completely gone. However, we did have to restart the router a couple of times when the Wi-Fi ground to a halt and even impeded access to the router's Web interface. Apart from those times, which were after heavy download and media streaming sessions (we're talking many days of transferring 15-30GB per day), the router plugged away at its intended jobs without much bother. The WRT1900AC is a router only, which means you’ll have to bring your own modem. We plugged in our trusty TP-Link ADSL2+ modem router, as we currently do for all our router tests. There are four Gigabit Ethernet ports at the rear, which we used to connect an Asustor NAS device and a couple of media streamers, and you also get USB 3.0 and eSATA for storage. On the surface, this router has the same stackable Linksys WRT styling for its enclosure as the original WRT54G router, circa 2002. If you look closely, you can see through the vents at the top of the router and down into the heart of the unit. Most visible here is the fan that keeps the unit’s 1.2GHz processor cool — it wasn’t noticeably noisy during our tests, during which we placed the router in a living area. Around the edges there are four menacing (and removable) antennas with Beamforming support, which can concentrate the signal where your devices are. It's definitely a piece of kit that any enthusiast would love, and enthusiasts have indeed traditionally flocked to Linksys units, mainly for their support of open source WRT software. OpenWRT support wasn't great for this router from the beginning, due to some aspects of its Marvell chipset drivers not being available to open source developers. The actual software interface that comes with the WRT1900AC is modern and falls into line with many of the more graphical ones that we’ve seen from other routers on the Australian market. There is a lot of icon usage, a dashboard of regularly used features, and even drag-and-drop functionality for some of its features (such as Media Prioritization). It’s not overloaded with options to play with, and seems to have just the right amount of features for intermediate and high-end users to play with. One of the main features, and potentially very useful, is the inclusion of a visual network map so that you can see at a glance how many devices are on your network, and what they are. However, this wasn't always accurate during our tests. For example, it assigned duplicate display names to different devices, which we then had to examine in detail and edit to give them their correct names. A useful aspect of the network map is that it can show you in real time which devices are currently using your Internet connection, and how much of it. Bandwidth usage can be viewed from the network map so you can see which device is consuming the most. You can head to the Media Prioritization page in order to give a higher ranking to the devices, services, or applications that need the best quality of service. We tested this by downloading a game from EA's Origin service while at the same time initiating a BitTorrent download and starting a YouTube video. Without prioritisation, the torrent file (which was downloading directly onto our NAS device) got most of the bandwidth, the video (which was on another laptop) played, and the game got some bandwidth, too. Bandwidth prioritisation can be given to devices or services and apps that need it. When we gave priority to the laptop that was downloading the game, it downloaded it at full speed (over 900 kilobytes per second), while the torrent slowed to below 60KBps and the YouTube video failed to play. 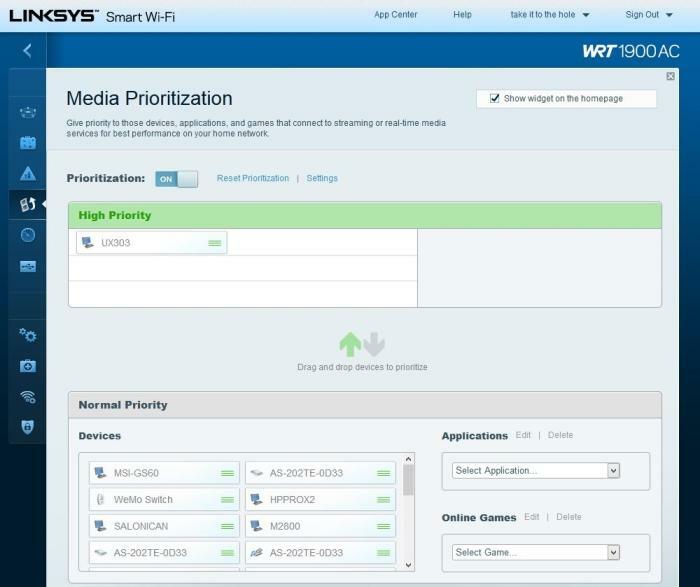 Devices are listed below the prioritisation field, and you can drag and drop the ones that you want to give priority bandwidth. One annoyance is that old devices which are no longer on your network will still show up in that list, and there is no way to delete them that we could find. Sharing a hard drive through the WRT1900AC proved to be a good experience, with the router giving access to files off our USB 3.0 hard drive in a swift manner. Large files transferred to our laptop (up to 3m away) at a rate of 27 megabytes per second (MBps) off the hard drive, while smaller files transferred at 25MBps. We had no issues browsing folders and streaming video files a short distance away to our WD TV Live media streamer over the 2.4GHz network, and to other devices such as a Fetch TV box and a Seebo Max STB media streamer over Gigabit Ethernet. DLNA is supported. You can password-protect access to attached drives through the router's Web interface. There is a built-in SPI firewall, VPN passthrough is supported, and port-forwarding can be accomplished through the Apps and Gaming tab in the Security section of the Web interface. 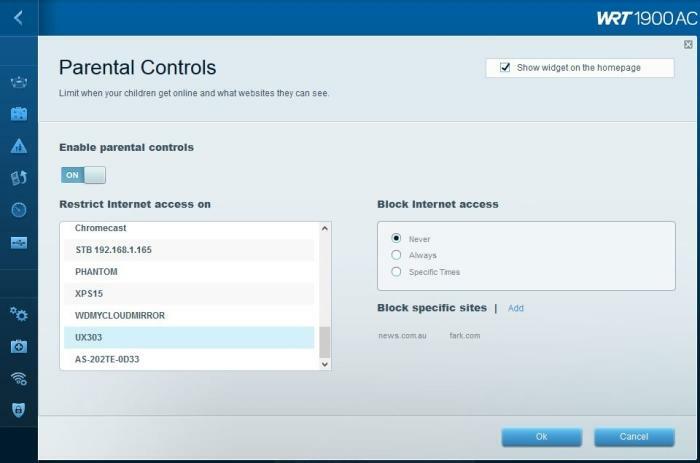 Parental controls are also present, and they can be applied individually to any of the computers that are on your network. Simply click on the computer in the list (again, old devices are present) and add any sites that you want to be blacklisted for that particular computer (only domain names are blocked, not keywords). The Internet can be disabled outright at specific times, too. 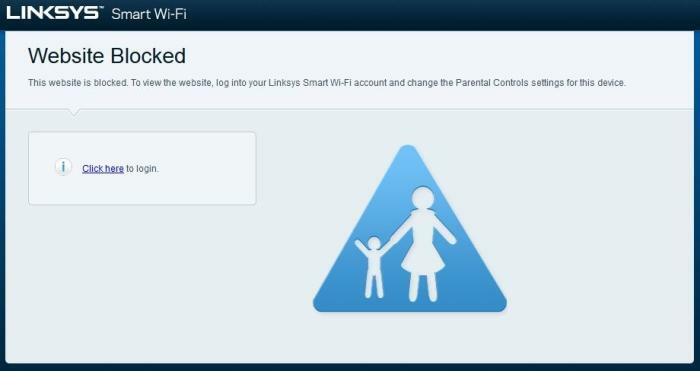 Parental controls can be applied to each device on the network separately. The message that greets users who try to access a blocked site. 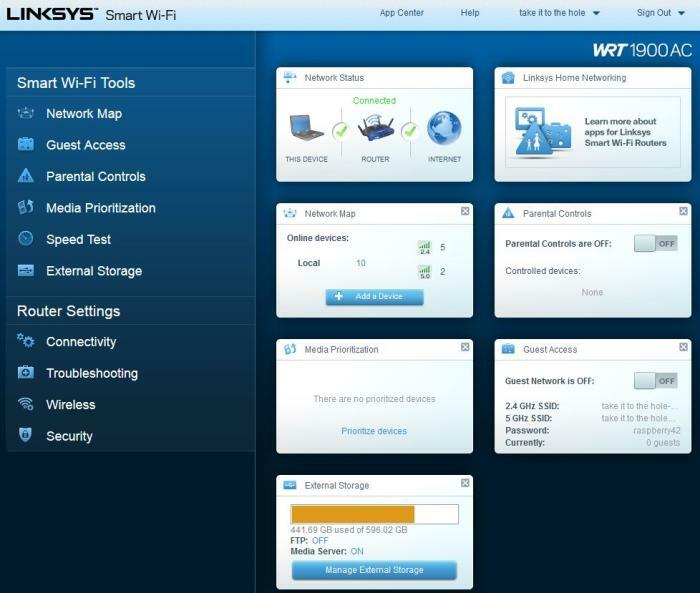 When you set-up the router, you can create an account on the Linksys Smart Wi-Fi site, which will then keep track of the IP address of your router, and allow you log into it simply by visiting the Linksys Smart Wi-Fi Web site. 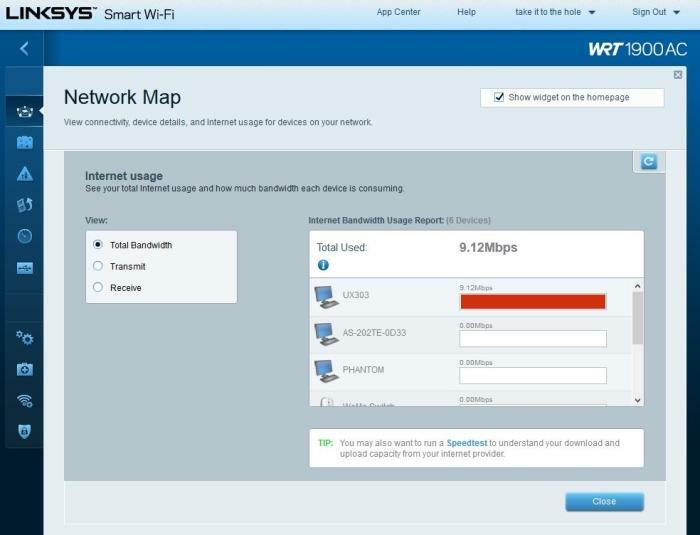 This will give you to access the router as if you were right there at home (except for some features, such as the Internet Speed Test, which can't be run remotely). If you'd prefer not to use this setting, it can be disabled from the Administration tab in the Connectivity section of the router's Web interface. Is the Wi-Fi really fast? Since it’s a simultaneous dual-band router, you can use both the 2.4GHz and 5GHz wireless radios at the same time, which can be useful for segregating traffic in your home network for specific tasks. The bandwidth from the 2.4GHz network can be used on computers that only need Internet access, while the 5GHz band can be used on computers that need the extra speed for transferring large files. You can also enable Guest access for the network so that visitors to your home can grab some Internet access from you, but not access your local network as a whole. In our 802.11ac performance tests, the WRT1900AC proved to be satisfyingly quick from both short distance (3m) and mid-range distance (15m). We copied sets of large files (1-2GB MP4 files) and small files (3-30MB MP3 and FLAC files) from our Gigabit-connected NAS device to a Lenovo ThinkPad Yoga laptop quipped with an Intel Dual Band Wireless-AC 7260 adapter. The large files averaged a transfer rate of 32.9MBps from the short distance, and 17.13MBps from the mid-range distance. The peak transfer speed was 44MBps. The small files averaged 32.47MBps from the short distance, and 16.01MBps from the mid-range distance, with the peak transfer speed being 19MBps. Large file transfer from 3m away. Large file transfer from 15m away. Small file transfer from 3m away. Small file transfer from 15m away. Importantly, we achieved consistent results when we ran these transfers multiple times. We will also mention that when we used a Lenovo Yoga 3 Pro laptop with a built-in Broadcom 802.11ac module, we achieved an average transfer rate of 45MBps for large files in the same tests, with the peak being being a much faster 57MBps. While these 802.11ac results aren’t the fastest we’ve seen to date (the Netgear Nighthawk and the Belkin AC1750 were both faster in our environment), they show that the Linksys also isn’t a slouch, and nor should it be considering it’s a premium product. It will perform differently based on the conditions in your own environment and the equipment that you use to connect to it. For our comparison purposes, it’s up there with the fastest products, especially when we take into account its performance with the Broadcom-based laptop, which outperformed the Intel-based laptop. But it took a while to get that good performance out of this unit. It wasn’t until Linksys released a firmware update that we could get stable performance out of it, and from our experience with this product, it looks like it could still use an update to clean up some of the features in its interface (such as allowing the removal of old devices from the lists for QoS and parental controls). Consider this router if you want to distribute an ADSL2+, cable, or fibre connection to many wireless devices in a busy home, and especially to 5GHz devices capable of 802.11ac transfers. The interface is suitable for inexperienced users, its parental features are simple to implement, and it has a remote access feature that is useful for logging in anywhere you have an Internet connection to view and change the router’s settings. Those of you with hefty Gigabit Ethernet needs should also consider it. Linksys has an optional $99 WRT 8-port Gigabit Ethernet Switch (SE4008), which has the same design as the WRT1900AC so that both products can be stacked. If you’re after OpenWRT support, then approach with caution and read through the thread on OpenWRT.org for the latest updates.